Cassida Pro is a division of Cassida North America, America’s number one brand in business grade cash processing solutions. 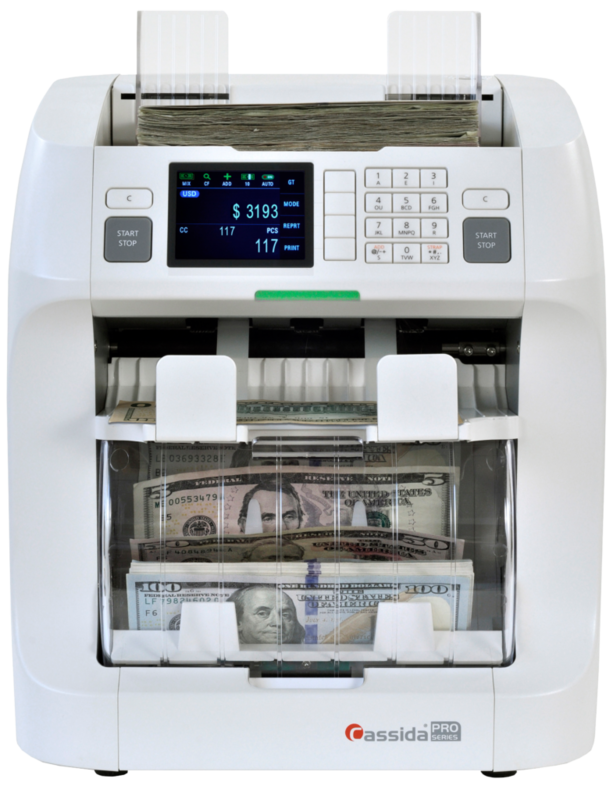 For over a decade we’ve enabled small businesses to count, detect and process cash. Now we’ve built our innovative Pro Series brand to specifically serve banking, financial institutions and larger retailers that require heavy duty, accurate and advanced solutions to meet their high volume cash processing needs. All Cassida Pro Series products are developed to solve real-world needs. We work directly with tellers, cashiers and cash room employees, using their feedback and insight to build better, more intuitive products that streamline processes, save time and improve efficiencies in cash handling. Our lineup of products continues to evolve and products are continually being developed by our US-based product development team. Check back often to see what new ideas and innovations we’re bringing to market. Reimagining the Solution: Cassida Pro is a vision of the future for cash processing and money handling solutions. The Cassida Pro Series is driven by innovation, technology and the desire to help our partners better serve their customers. With many years of experience, industry expertise and the strength of our robust internal capabilities, the Cassida Pro organization is primed to develop and deliver products and services vital to casinos, banks (FIs) and larger retailers. Our engineering and product development teams work together to ensure quality. Our goal is to make Cassida Pro your lifetime partner. That’s why Cassida Pro Series products are subject to stringent quality control measures during the manufacturing process and are backed by a comprehensive parts and labor warranty. You can rely on the Cassida Pro technical support team long after your original purchase. The Cassida Pro partnership network is unique to the industry because it brings together independent Value Added Resellers (VARs) who provide both sales support and service for Cassida Pro Series products. Our partners are always in the field, assuring our products live up our promises. In addition to tapping the expertise of our VARs, the Cassida Pro Series Product Development team works directly with front-line users such as tellers, cashiers and vault managers from around the country. These interactions allow us to gather valuable insights from those who use these products every day for teller setups, customer deposits, currency strapping and sorting and integration. Working directly with end users has led to the development of key functions that reflect real-world needs.